Note: Confidence interval derived from NYMEX options market information. EIA expects non-hydroelectric renewable energy resources such as solar and wind will be the fastest growing source of U.S. electricity generation for at least the next two years. EIA’s January 2019 Short-Term Energy Outlook (STEO) forecasts that electricity generation from utility-scale solar generating units will grow by 10% in 2019 and by 17% in 2020. According to the January STEO, wind generation will grow by 12% and 14% during the next two years. 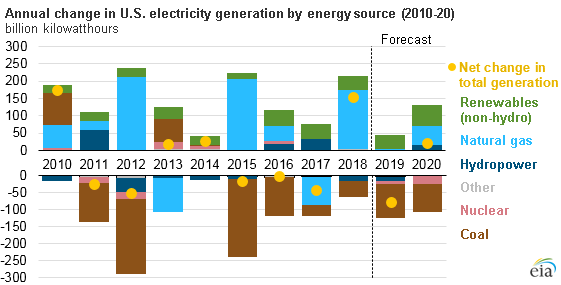 EIA forecasts total U.S. electricity generation across all fuels will fall by 2% this year and then show very little growth in 2020. EIA projects that the share of total U.S. electricity generation produced by all renewables other than hydropower will increase by three percentage points during the next two years, from 10% of total generation in 2018 to 13% in 2020. This projected growth is a result of new generating capacity the industry expects to bring online. About 11 gigawatts (GW) of wind capacity is scheduled to come online in 2019, which would be the largest amount of new wind capacity installed in the United States since 2012. EIA expects electricity generated from wind this year will surpass hydropower generation. An additional 8 GW of wind capacity is scheduled to come online in 2020. The share of total U.S. generation from wind is projected to increase from 7% in 2018 to 9% in 2020. Solar is the third-largest renewable energy source in the United States power sector, having surpassed biomass in 2017. The U.S. electric power sector plans to add more than 4 GW of new solar capacity in 2019 and almost 6 GW in 2020, a total increase of 32% from the operational capacity at the end of 2018. Because of this increase, solar is forecast to contribute slightly more than 2% of total utility-scale generation in 2020. In addition to utility-scale solar in the electric power sector, some residences and businesses have installed small-scale solar photovoltaic systems to supply some of the electricity they consume. EIA forecasts that small-scale solar generating capacity will grow by almost 9 GW during the next two years, an increase of 44%. Even with the growth from renewable energy sources, fossil fuels will still provide most of the electricity generated in the United States. 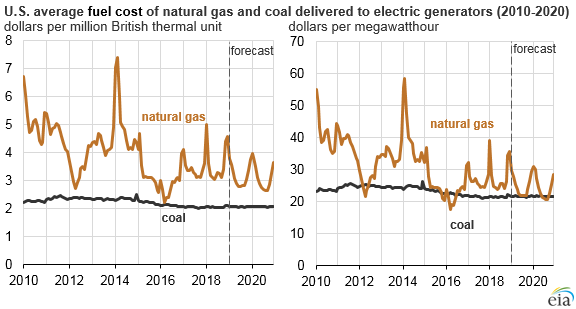 Coal and natural gas combined provided 63% of electricity generation in 2018 and EIA forecasts that they will provide 61% in 2020. Natural gas fueled 35% of total U.S. electricity generation in 2018, up from 24% in 2010. In contrast, the share of total generation from coal-fired power plants fell to 28% last year from 45% in 2010. EIA forecasts the natural gas generation share will grow to 37% by 2020 and coal will continue declining to 24% by 2020. Note: Costs in dollars per megawatthour are calculated using average coal and natural gas heat rates as reported in Electric Power Annual Table 8.1.